The Rodeo City Rollergirls had a witchy good time at our last home bout of the season! We appreciate all of our fans that showed up, especially those in costume! We thank the Boneyard Brawlers and Columbia Basin Roller Derby for traveling out to give us their best skating and costuming! This was the last season for three of our veteran skaters. Ricki Bobby, Mad Mina, & Shirley Whackaho have given their all on the track and in volunteer hours to this league. Never fear! A couple of these ladies will still be around volunteering for RCR. YAY! Speaking of volunteers, thank you to everyone that gave their time to make this such a great evening! The final score for our scrimmage the first part of the evening was Rodeo City’s Beauties 123 to CBRD 73. Columbia Basin voted Candy Crunch as the Beauties MVP! The final score for our bout the second half of the evening was Boneyard Brawlers 227 to Rodeo City’s Posse 153. 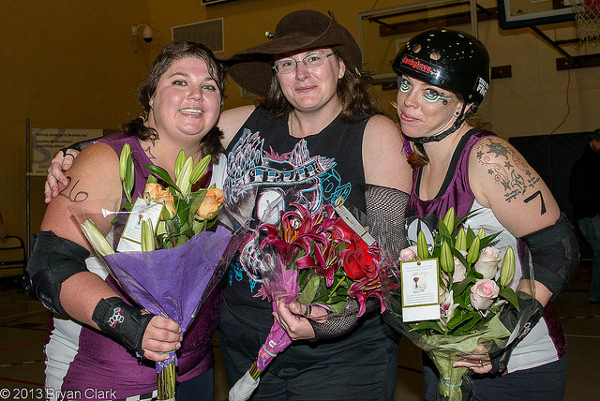 Boneyard Brawlers voted Runaround Sue as The Posse MVP! RCR photographer Bryan Clark was there to capture a bit of the fun. Have a look on our photos page.